Every great story begins with a time and a place. One such story involves a brand that is familiar to most, Mount Gay. Created on the Caribbean island of Barbados, the land that back in 1703 called rum ‘kill-devil’, a gentleman named Sir John Gay, a respected leader and businessman who worked tirelessly in service on the island, was requested by friend John Sober to help manage an unknown distillery he had inherited. Sir John Gay took quickly to the business of making rum. He refined the distillation process and began producing what we know today as Mount Gay Rum. With this, Mount Gay Rum is the oldest existing brand of rum in the world. So how did Sir John Gay create Mount Gay? Using hand cut Barbadian sugar cane, the cane is mixed with coral filtered water and a proprietary strain of yeast to ferment in the open air of Barbados. Once fermented, the mix is then distilled within traditional double copper pot stills which is then matured in charred white oak barrels which have previously held American whiskey. 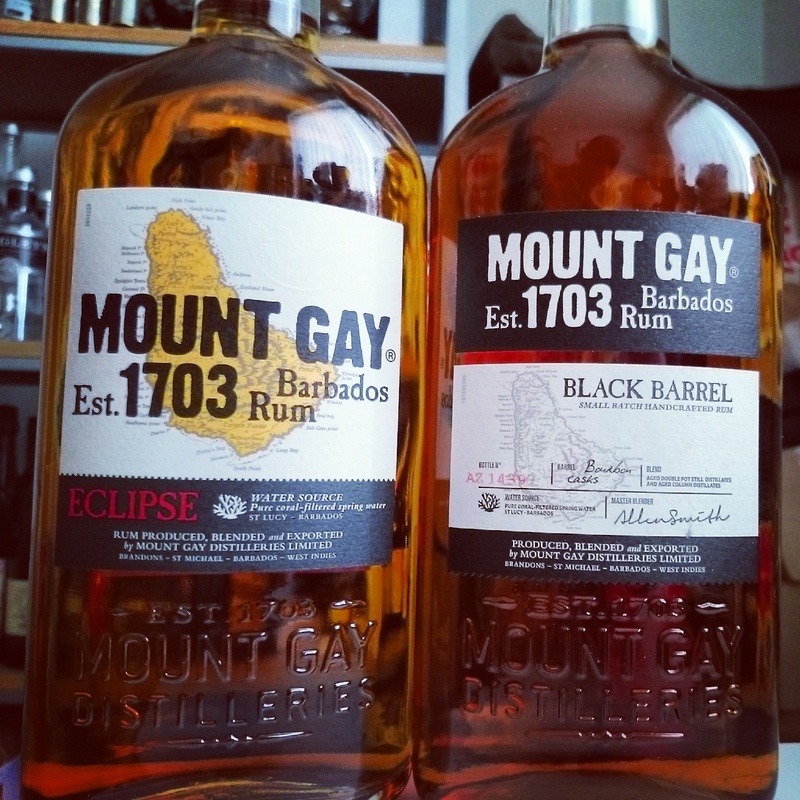 After ageing, it is then blended by Master Blender Allen Smith to create the Mount Gay range. Named for the ‘double phenomenon’ of a total solar eclipse and the passage of Halley’s comet in 1910. Light, butter scent on the nose with a floral edge of vanilla striking through. A little sharp on the palate with heavy fruit flavours and banana dominating. Kicks of wood and vanilla cause it to linger for a while. Released in the UK in May 2014, but the US in April 2013. The only Mount Gay rum finished in charred bourbon oak barrels after blending. Black Barrel is made from sugar cane molasses, within column and pot still rums, and has a higher proportion of pot still than any of the other Mount Gay expressions. Sublte, smooth notes of vanila on the nose,with a slightly charred aroma of treacle and toffee. Soft, buttery and slight kicks of pepper on the palate. Light cinnamon seems to dominate the finish, with thin textures of vanilla and toffee creating a long experience. A great rum, with expressions including Silver, Extra Old and 1703 also available, it’s a collection worth having. One to look out for in many tiki and rum shack’s in your local city too. Or make it a handy bottle to have within your drinks cabinet. The Black Barrel is an expression worth trying, and reminds me a little of another category taking advantage of the ‘black barrel’.